jbs inspiration: love this now. I recently decided to start keeping track of and posting a sort of currently loving/right now type of post to keep track of the fun stuff in life that starts popping up regularly. It's been fun to keep in mind as I snap photos, and look back through them. 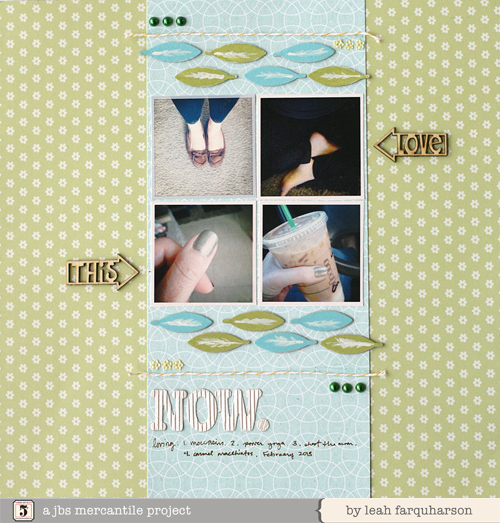 The new Modern Mercantile line is perfect for scrapbooking everyday moments. And I'm loving the freshness of the green and blue. The chipboard feathers were perfect with the speckled egg and stick candy paints, and just a touch of white brushing in the center... I was lucky enough to get this fabulous line in the February kits - which just happen to have been restocked! Snap them up while you can! It's lovely to work with. And don't forget to take a moment to document your current loves - those usually end up being some of my favorite pages to look back on! This is so fantastic Leah! I need to do a currents layout. Thank you for the inspiration! so love this! one of my fave layouts!